This is so agonizingly stupid. No, not Donald Trump barging into John Kelly’s office to tell reporters he’ll speak to Robert Mueller under oath because Hillary. That’s not…well…it is incredibly stupid. But somehow, it’s not as stupid as the madness that spread to the very top of Republican politics over the past few days in defense of the man doing everything within his power to make it look like he’s trying to obstruct justice. The Republican Party proves each and every day that irony is truly dead in America. For those of you with the discipline to avoid this kind of nonsense that escalated from InfoWars to the top of the Senate Homeland Security Committee, here is Republican Senator from Wisconsin, Ron Johnson, debasing himself to the point where Fox News practiced something resembling journalism for a moment. Spoiler alert folks: the “secret society” these FBI agents were referencing was a joke. Now apparently, for some Congressional Republicans, I need to explain this concept. The rest of you can move on to the next paragraph. 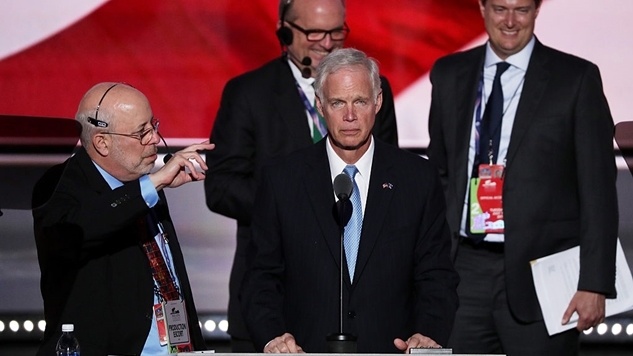 You see Ron Johnson, a joke is something amusing or ridiculous that humans say to make each other laugh. Laughter is the result of feelings like joy or happiness. You can have your staff Google those terms for you. Bottom line: jokes aren't real. They're…well…jokes. “Are you even going to give out your calendars? Seems kind of depressing. Maybe it should just be the first meeting of the secret society,” FBI lawyer Lisa Page wrote to senior FBI agent Peter Strzok, who was working on the FBI's probe of Russian meddling in the presidential election and would later join Page for a brief period on Special Counsel Robert Mueller's team. That text stands alone in the series of messages obtained by ABC News — with no apparent tie to other messages sent before or after it. The other conspiracy that gripped Republican politics was the supposed disappearance of texts between these agents. The Chief Political Correspondent for Sinclair—the conservative media giant running interference for President Trump—put the kibosh on that absurdity too. This is the central problem with Republican politics. Over the last few decades, they took their “liberal media bias” to such an extreme that the echo chambers they set up literally do not exist within reality. Republican politicians are stuck in an eternal dance between campaigning to win Republican primaries amongst a group of voters manipulated by a perpetual torrent of right-wing propaganda that tells them liberals will kill them all, and, well, something resembling reality in the general election. It's all utterly depressing, really. But the silver lining is that it produces humiliating moments for the perpetrators of this insanity, like Republican Senator Ron Johnson. Here's CNN Manu Raju confronting Johnson today with the ABC report. The Republican Party is America’s biggest impediment into modernity, and until we find a way to bring them back to reality, we will continue to watch our politics devolve into right-wing talk radio fever dreams.